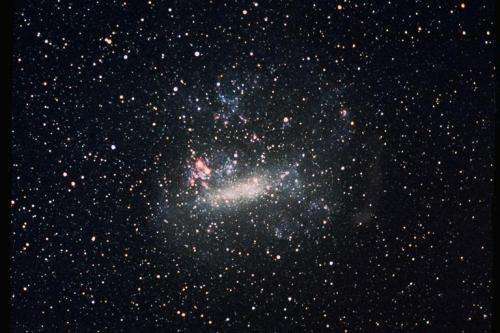 An international team of astronomers has revealed an 'astonishing' overabundance of massive stars in a neighbouring galaxy. The discovery, made in the gigantic star-forming region 30 Doradus in the Large Magellanic Cloud galaxy, has 'far-reaching' consequences for our understanding of how stars transformed the pristine Universe into the one we live in today. As part of the VLT-FLAMES Tarantula Survey (VFTS), the team used ESO's Very Large Telescope to observe nearly 1,000 massive stars in 30 Doradus, a gigantic stellar nursery also known as the Tarantula nebula. The team used detailed analyses of about 250 stars with masses between 15 and 200 times the mass of our Sun to determine the distribution of massive stars born in 30 Doradus - the so-called initial mass function (IMF). Massive stars are particularly important for astronomers because of their enormous influence on their surroundings (known as their 'feedback'). They can explode in spectacular supernovae at the end of their lives, forming some of the most exotic objects in the Universe - neutron stars and black holes. Co-author Hugues Sana from the University of Leuven in Belgium said: 'We have not only been surprised by the sheer number of massive stars, but also that their IMF is densely sampled up to 200 solar masses.' Until recently, the existence of stars up to 200 solar masses was highly disputed, and the study shows that a maximum birth mass of stars of 200-300 solar masses appears likely. In most parts of the Universe studied by astronomers to date, stars become rarer the more massive they are. The IMF predicts that most stellar mass is in low-mass stars and that less than 1% of all stars are born with masses in excess of ten times that of the Sun. Measuring the proportion of massive stars is extremely difficult - primarily because of their scarcity - and there are only a handful of places in the local Universe where this can be done. The team's research leaves many open questions, which they intend to investigate in the future: how universal are the findings, and what are the consequences of this for the evolution of our cosmos and the occurrence of supernovae and gravitational wave events? The demonstration that the IMF can vary by as much as hundreds of M⊙ is a very important parameter in models of stellar evolution. So does this mean we have a little less dark matter to account for? We haven't seen many of these massive stars likely because they don't last very long. The bigger stars tend to be more unstable and can have multiple supernova events. Studying these new stars should be insightful.